With the herald of every new set, nerds everywhere mash F5 on their keyboards at midnight hoping to catch a few morsels of spoiler-season goodness. Chief among the fan favorites are the planeswalkers, where speculators stay up way past their bedtime throwing their predictions into the ring. Everyone wants to have a record of their long-term assessment validated down the road. If there’s one thing Magic players like being, it’s right, and so far planeswalkers have had the biggest window for both price and play. Jace, the Mind Sculptor put an obvious wariness in players’ minds because being wrong could lead to shelling out hundreds of dollars for a playset. Make no mistake, Wizards is far from willing to print a planeswalker near as powerful as Jace 2.0 again anytime soon, but the point remains that you don’t want to get blown out either by picking them up too early or missing out until it’s too late. My point is not to throw a price estimation out, nor is it to predict any short-term or long-term success of either planeswalker. I’d merely like to illustrate some potential uses, as well as provide a point of view for how each could be used. The first new planeswalker is the third of its generation, Liliana of the Dark Realms. At an initial glance, Liliana of the Dark Realms doesn’t exactly fit the bill for what a good planeswalker is all about. The easiest rubric is a simple “Can this planeswalker protect itself?” The best and most played planeswalkers in the game all had some way of protecting themselves, either by affecting your opponents’ creatures or generating creatures as a means of blocking. Liliana of the Dark Realms fails this test, unless you count her -3 ability as a means of removal. Starting at a mere three loyalty means taking that course of action treats her as an expensive sorcery speed conditional removal spell. Under the right circumstances it’s the correct course of action, but I wouldn’t ever be too happy about tapping out Turn 4 just to nug a flipped Delver of Secrets. Why this ability costs more to use than Liliana of the Veil’s secondary ability is beyond me, and she doesn’t have the luxury of dealing with Geist of Saint Traft or Invisible Stalker, which are very real threats in the metagame. The immediate saving grace in Liliana of the Dark Realms is that her +1 yields real card advantage, which I can appreciate. We’re not talking about that nonsense ‘virtual’ card advantage. We’re talking cold, hard, card-you-can-taste-in-your-mouth advantage. Guaranteeing that card is always a Swamp is hardly exciting, and a 4-mana Caravan Vigil plus Sacred Nectar for 2BB is nothing to write home about. Unanswered she can run away thinning your deck and generating advantage every turn. Let’s be real though. A best-case scenario of Land Taxing for one a turn never won anybody a game on its own, and if I’m unobstructed from using my four-mana planeswalker for multiple turns in a row I expect to be winning the game. Then again, Liliana Vess got her time in the sun in UB Control right before rotating out of Standard a few years back, where the added discard each turn was relevant to control mirrors. Vess’s tutor ability and threat of a game-ending ultimate were big factors into her seeing play, and I can’t say the same about Liliana of the Dark Realms’ second and third ability. Even still, there are ways to make any card in your hand an asset even if it is an essential blank. Brainstorm is often considered the best card in Legacy because putting two ‘blank’ cards on top of your library and then shuffling via a fetchland feels a lot more like Ancestral Recall instead of a cantrip. While Brainstorm is not legal in Standard and I’m CERTAINLY not going to advocate Liliana of the Dark Realms in Legacy, there are other options to take advantage of this. Namely, looting effects. Faithless Looting is the premier example. It’s a card that has been hyped by the ever-watchful eye of the community since its initial spoiling. While the card is inherent disadvantage, the selection you get is great and the flashback makes it work even better in graveyard-related strategies. Any draw into discard effect makes Liliana’s +1 ability a land if you need it, and a generic “draw a card” if you’re feeling flooded. Even random discard effects via Desperate Ravings and Tibalt, the Fiend-Blooded benefit from padding your hand with extra Swamps, lowering the percentage chance you’ll discard a business spell. Actually want to keep that Swamp your getting? Just loot before fetching up the Swamp. I couldn’t tell you how often I’ve been turned off from playing Desperate Ravings because I randomly pitched the one land I drew and needed to keep. A few people have speculated that Diabolic Revelation was a plant to make Liliana’s ultimate viable, but really now? You expect me to get this idiot in play, do nothing for fetch turns but fetch Swamps from my deck, ultimate her so I can have this card and … find more cards from my deck? Exactly how many do-nothing cards am I going to have in my deck, and how am I going to fit in the X amount of win conditions needed? If I’m playing Liliana in a control shell, I’m not running that many win conditions to begin with and I certainly don’t want a conditional tutor that only works under sparse circumstances. There are a couple reasons I can see this ultimate being useful without bogging down your deck with otherwise worthless spells sans Liliana emblem. Forbidden Alchemy is a card that sees a lot of love despite being rather slow because it’s instant speed card selection that can easily fill your graveyard with Flashback spells or fatties to reanimate. Flashing back Alchemy is really just icing on the cake, and while enough games go long enough to hit that seventh land, most players have sculpted hands that they have better things to do with at seven mana. With an active emblem, you can just as easily flash this back with your land without too much fear of a cheap counterspell getting in your way. Mainphase flashback Forbidden Alchemy, slam Nicol Bolas, Planeswalker is a reasonable play with the emblem, and I can guarantee I will attempt to build a deck capable of doing this for at least one FNM. In the same vein, reasonable cards to play without the emblem but get drastically better with it are other X spells. Diabolic Revelation doesn’t make the cut, since there’s no way that card would be playable outside of having an active ultimate. Devil’s Play is a reasonably costed removal spell that later on can dome the opponent for a lot. I can’t say I’m too impressed with this Liliana. In a different world where creatures weren’t 3/2 fliers for U and UB control is a real deck, perhaps the free land every turn is worth running a copy or two. Even then, Liliana of the Veil comes down a turn earlier while posing a larger threat via a relevant ultimate. The main redeeming quality she has is filling your hand with Swamps as pitch fodder for Faithless Looting, which is too expensive and too fragile an engine. Looting has already found a home in a plethora of reanimation-based strategies, which are more powerful and easier to set up than this engine. My verdict is save this one for your five-color Cube and Commander decks. Do the right thing and play the three-mana version. Now THAT’S what I call a planeswalker. Not to go Evan Erwin on you guys and say buy him out at 30 bucks a pop, but he’s actually not too shabby and a definite a step in the right direction. Ajani, Caller of the Pride requires a very specific deck, and jamming him into any ol’ 75 probably won’t yield great results. Ajani marks the third planeswalker printed at three mana behind Jace Beleren and Liliana of the Veil — both of which saw plenty of play in multiple formats. Moreover, Ajani is the type of planeswalker that can often and should often be played on Turn 2. Looking at Standard, there’s plenty of easy ways to hit double white. With the reasonable assumption Ravnica Shocklands are being reprinted, there’s Arbor Elf, Avacyn’s Pilgrim and Birds of Paradise (if we’re lucky enough to see him in Return to Ravnica) as guys that can produce white via Turn 1 play. Standard currently has a good number of aggressive power-3 drops, but that’s about to change come this fall. Both Swords and Birthing Pod are on their way out, and while Ajani doesn’t really exactly strike fear into the heart of an opponent as much as a Turn 2 Sword or Pod, he seems like a decent enough replacement. Much like a Sword or Pod, Ajani provides a wrath-immune threat that can come down early and turns each one-drop into a threat. A +1/+1 counter a turn on a single creature isn’t quite as devastating as the bonus of a Sword or a line of creature upgrades, but the threat of a game-ending ultimate without the need for other creatures provides some merit to the card. Ajani doesn’t require a mana investment past the first three, which frees up your mana to follow up with a four-drop while still allowing Ajani to be used. This is beneficial both for curving out and to avoid being blown out by removal. The current Standard environment is incredibly tempo based, and a couple well-timed Gut Shots or Vapor Snags on Sword equips lead to board states where you get too far behind to come back against any reasonable amount of pressure. Just as a successful early sword equip can take away a game easily, a couple failed equips can lose games just as handily. In other words, Ajani is like a lower risk, lower reward sword with a couple of game-state-specific upsides. You can argue that since he’s a planeswalker and not an artifact he is more vulnerable in the sense that he can be attacked to death. But essentially starting with a staggering five loyalty for such a small investment early on means most players won’t be willing to throw too many resources (if they have them) at dealing with him. You can argue whether Ajani plays a better role than Sword or Pod in any given deck archetype, but it’s really not going to matter in a manner of months. If I were a betting man I would be picking these guys up if I’m planning on running a postrotation deck similar to one now that uses Swords. It’s also helpful to note that Ajani’s +1 ability can target any creature, it doesn’t have to be your own. While it won’t be around much longer, Phantasmal Image has been a real problem for the past year and being able to kill them off on the cheap is valuable. Another example is Undying creatures, when sometimes you really just want to kill it and have it stay dead. Giving opposing Strangleroot Geists and Geralf’s Messengers +1/+1 counters ensures that #YOLO. Turn 2: Play Ajani, pump said dork. Turn 3: Play Sublime Archangel, add a +1/+1 counter to it with Ajani. That scenario may be more a testament to how absurdly good Sublime Archangel is (and she certainly is) instead of Ajani, but either way it’s not that unusual with Exalted being higlighted. This leads to attacking with one souped-up creature. Evasion and doublestrike on that creature can lead to some pretty devastating results; namely, your opponent’s smoldering ashes. At -8 loyalty, Ajani’s ultimate takes a little working up to, but is typically going to win the game the following turn barring any kind of board wipe or Rhinoceros fogging. And it’s not too hard to accomplish. Starting with a massive five loyalty once ticked up, Ajani can ultimate as early as Turn 6 assuming a Turn 2 play and starts with a big enough buffer to suffer a couple hits and survive. A smart aggressive player can sit on an active Ajani, gaining residual advantage via counters every turn, threatening an ultimate only when you’re behind on board. For funsies, activate this and drop Fervor on board, guaranteeing your opponent’s place six-feet under. It’s difficult to tell based on the vast unknown that is Return to Ravnica what the format will look like postrotation, but per usual, looking at popular decklists that don’t lose a large part of their deck is a good place to start. Ajani fits best in an aggressive deck running your standard suite of mana bugs. The premier mana bug aggro deck currently reigning is RG aggro. This is largely in part due to great four-drops in Huntmaster of the Fells and Hellrider, backed up by early acceleration, Swords and resiliency through Green Sun’s Zenith. Other Naya Pod decks have shown up; boasting aggressive starts with 1 drop accelerants into cost-efficient threats as well as the ability to grind out residual value via Birthing Pod and Restoration Angel. If a Naya mana base can be supported, that would be my suggested route for an aggressive deck postrotation. Ajani fills the role of a good three-drop to grant resiliency and value, while Huntmaster, Restoration Angel and Sublime Archangel do work on your opponent’s life total. Champion of Lambholt hasn’t quite reached playability status yet, but that could very easily change when playing in conjunction with Ajani, making all your creatures practically unblockable fairly quickly. 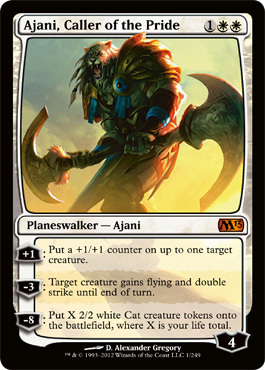 As an easy-to-cast planeswalker that contributes to the board presence as soon as it hits the table, I’d rate Ajani, Caller of the Pride as A-plus, would print again. I have personal hopes for the Simic guild in Return to Ravnica, previously a counter-themed guild with the Graft mechanic, to have some cool interactions with him. As always, time will tell. Now I’d like to do a brief revisit of the three returning planeswalkers from M12. Titans have put an ugly requirement on high-mana spells for two years. When nothing quite stacks up to the power level they possess, why bother playing anything else? Baneslayer Angel, a once $50-plus card was almost instantly shoved aside once M11 came out because for one more mana, a much more reliable and powerful affect could be attained. Garruk, Primal Hunter also fell into this category of “not quite good enough” five-drops. Green Sun’s Zenith has been a common four-of staple in practically every non-Pod strategy since its printing, both in ramp and aggro decks. Birthing Pod fits a similar but different niche. These two cards are very reliant on creature heavy decks, and deckbuilders find there isn’t much room for noncreature cards in these kinds of strategies. This is why Garruk, while being powerful, often finds himself getting cut in lieu of more diverse targets. With the absence of these powerful tutor cards postrotation, green decks will need to go back to more traditional builds. The menace that is UW Delver makes Garruk look pretty flimsy. Creature tokens have always been pretty weak to Vapor Snag, and if there’s one thing I learned from this format is that you don’t want to play a deck weak to Vapor Snag. Cheap threats like Delver and Geist make quick work of a four loyalty planeswalker at five mana, assuming you can get him to resolve through Mana Leak. Luckily Mana Leak, Vapor Snag and Ponder are all on their way out, giving a bit more breathing room for Garruk to bounce back. While Garruk has some powerful creatures to contend with, namely Thragtusk, in addition to the protection Cavern of Souls brings for them, I think there will be a place for him in this upcoming Standard environment. Blue has gained a powerful planeswalker with an identical mana cost that is a better hedge against a broader group of strategies. While Jace can be slammed on an empty board in a control mirror and steal the game, the situation comes up too rarely to be considered a legitimate option. Tamiyo, the Moon Sage has proven her worth as a planeswalker that can impact the board immediately while being a good card against aggressive and control decks. While Jace can fit a role, it’s hard to make up for the shortcomings that leaves him miles behind option-wise in comparison to Tamiyo. For red-heavy aggressive strategies, Koth of the Hammer provided a much more effective threat in both +1 ability and in his emblem. Never have I seen a game get locked up as fast as when a player lands a Koth on an unopposed board. I can’t say the same for a planeswalker that can dome the opponent for 1 a turn without any really threatening abilities. Koth rotating does shore up some room for Chandra to see some more play. I’m not excited about this card in Standard, but I think if it did have a place in Standard, it would be in some form of Grixis-control strategy. Taking an extra turn is one of the more powerful affects in the game, making Chandra’s -2 copy ability a real threat. While it’s unfortunately impossible to have Chandra perform a -2 into a Miracled Temporal Mastery, a hardcast for seven mana is reasonable in a control strategy. While I’m uncertain for the future of Standard and of each of these planeswalkers, I’m definitely excited to brew up decks with each and every one of them. Thanks for reading!